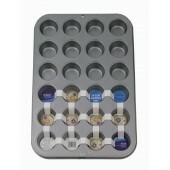 Patisse Muffin Pan-12 Cup Gorgeous Non-Stick Ceramic Coated dual colour, copper colour outside wi..
Patisse Quiche Pan with removable bottom - 9.5" Non-Stick Ceramic Coated dual colour, copper colo..
Chrome Cooling Rack Triple chrome plated for longer lasting shine. 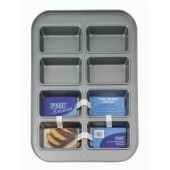 Size: 44cm x 32cm ..
PME Professional High Quality Carbon Steel 12 Cup Muffin Tin. 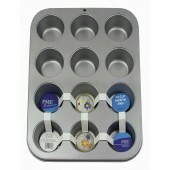 This tin is easy to clean with its..
PME Professional, High Quality Carbon Steel 24 Cup Mini Muffin Tin. 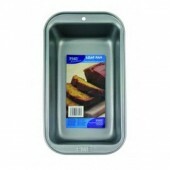 This tin is easy to clean wi..
PME Professional, High Quality Carbon Steel Non-Stick Mini Square Tin with 12 cavities. 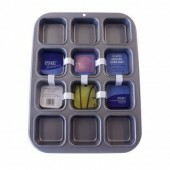 This tin is ..
PME Professional, High Quality Carbon Steel Mini Square Tin with 8 cavities. 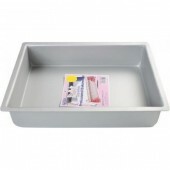 This tin is easy to cle..
PME Professional, High Quality Carbon Steel Non-Stick Loaf Tin. 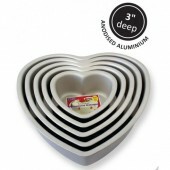 This tin is easy to clean with i..
6" PME Heart Tin PME quality bakeware is made from seamless anodised aluminium with straight ..
8" PME Heart Tin PME quality bakeware is made from seamless anodised aluminium with straight side..
10" PME Heart Tin PME quality bakeware is made from seamless anodised aluminium with straight sid..
12" PME Heart Tin PME quality bakeware is made from seamless anodised aluminium with straight sid..
8" X 12" PME Oblong Tin PME quality bakeware is made from seamless anodised aluminium with ..